New American Voices Play Reading Series in April - Printer Friendly Page - Local News - Theatre Port Houston - Theatre Auditions News and more! 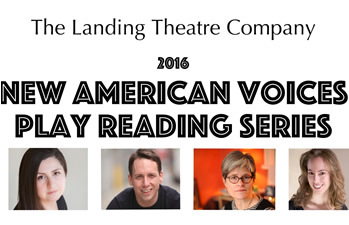 The New American Voices Play Reading Series annually features four new American plays by some of our nation’s top emerging playwrights. The plays are performed by local actors, and followed by a talkbacks with the playwrights, directors and casts. The weekend reading series is open to the public, and offers the seasoned theatre-goer a stimulating taste of what’s next in American theatre! Nadleehi and the Coyote, a story steeped in Navajo legend, tells the struggle of a Navajo mother who tries to protect her homosexual son from scandal in their predominantly Christian town by keeping his sexuality a secret. Not only does her son Yiska want to tell the world he's gay he wants to tell the world how in Navajo culture a gay boy, a Nadleehi or a two-spirit person, is revered and holds a sacred place in the community. When Nina fails to keep him safe she turns to Navajo legend for guidance where the supernatural meets the ordinary. Three brothers spend an evening at a rented beach house, trying to sort through the recent death of their father. Upon learning of their father's final wishes and with the unexpected arrival of their mother, the brothers come to terms with some ugly truths that lie underneath the humor they all share. It's 1975 and 52 year-old American, Stewart Carver, is living in his empty luxury lodge with his mistress in the southern wilderness of New Zealand. He's bewildered at the way the tide has turned against him. When he first arrived everyone was his friend and the luxury hotel he built and ran was considered revolutionary. But now, he's fighting his wife, his lawyers, the bank and the Prime Minister. Stewart's determined to win back and reopen his business, but everything and everyone is getting in his way. It seems the only friends he has are the rutting stag outside his cabin and the bottle of booze in his hand. When Maria, Rachel, and Molly, three girls from very different worlds, got thrown together on a school project about the local urban legend, they didn't quite bargain for some horrific ghost lady to start tampering with their lives. La Llorona, with her irreverent, haunting advice and strange versions of the story, seems intent on steering them away from her fate--or is she just luring them to a watery demise?